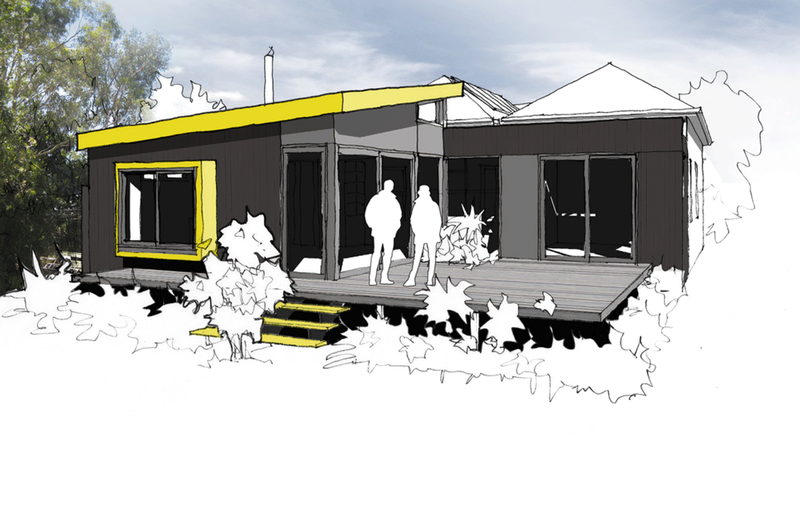 Sustainable extension to existing Victorian home in Northcote. Sustainable timber specification - rigorous specification process adopted with preference given to plantation pine, reconstituted timber products or recycled timber for all aspects of project (structural, cladding, interiors) almost eliminating use of virgin hardwood and timber from unsustainable sources. Embodied energy - high embodied energy materials such as steel, plaster board, concrete and ceramic tile reduced or eliminated. Where complete removal difficult or impossible low embodied options have been substituted. Thermal mass - low cost, low embodied energy thermal mass incorporated via custom designed "water wall"
Maximised retention and re-use of existing building and features - rear facade including cladding and leadlight windows retained and incorporated into new living areas. Minimised unnecessary work to existing front four rooms. Efficient services - gas fittings eliminated. Heating, cooling, applicances and domestic hot water all efficient electric models offset by existing solar array. Water efficiency - 100% retention of stormwater on site via new water tanks and garden dispersal system for overflow. Future connection of grey water provided. Clients love of kitsch - 50's inspired colours and detailing add personality and warmth.